In my opinion, TheRealSignals is the best provider of signals for binary options. Not just one but two great innovations have emerged this month in connection with this signal provider. Thanks to the innovations, we will eventually know whether these signals work and are profitable. April as a trading month has come to an end. 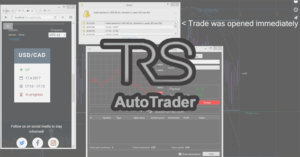 Throughout the month, traders have had the opportunity to use the TheRealSignals free of charge – see the announcement: Test signals in April for free. And what was the result? With an investment of $50 using the broker IQOption, we would have totaled $132. This is not a bad performance at all, given that the signals were free. However, should traders have to pay for the service, one would expect further improvements. The above information was recorded at 4 p.m., two days before the end of the month. Therefore the above figure does not reflect later signals. An announcement displayed at the organization’s website on 19 April informs that a Meta Trader 4 indicator, was underway to allow automated trading of all signals. In the future, traders should be enabled to use signals for trading without having to be confined to their PCs. This sounds tempting, doesn’t it! Public testing means the testing of new software, so it may happen anything. The software will be continuously updated by adding new features. Users will be allowed to trade signals in a normal fashion i.e. without using auto-trading. This means that everything will work as it is without the traders being forced to use a feature they dislike. Both trading options (manual and automated) show the same deals. Since this is just a test, it is recommended that for the time being users should use the DEMO account only. Does it mean that in the end, we all will be rich? I find this a great idea. I will be happy to test the software and write a review about it. We will eventually see whether this provider is worth choosing. Will the software be 100% profitable? Well, if it was, in theory, it would mean that in the future we all using this software would be rich. Honestly, I am not such an optimist and don’t believe that everything is going to be so rosy. Anyway, we will see how this evolves including some potential weaknesses. Follow our meta trader series with instructions and information about how to use the software etc.